Everyone is doing their bit to reduce their eco-footprint. Low-energy lights and appliances are a great place to start. So is walking and using public transport, but did you know you can also make your garden more eco-friendly? Well, you can. And here’s how! When choosing materials for your garden, whether it’s for fencing, a patio or even some garden screening, try and use recycled materials wherever possible. If you look around junk-yards and even construction sites, you can usually find things that will work perfectly. 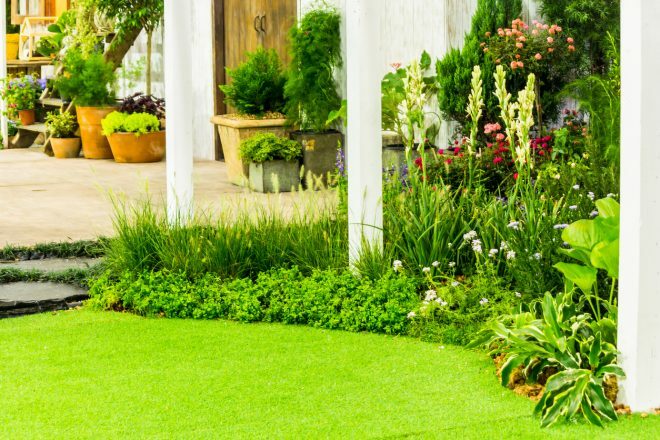 Another good option is to go with a landscaping service provider that is happy to source recycled materials for your project. Your material choice can significantly reduce your eco-footprint. For example, using composite instead of hardwood means you will be using recycled wood with a longer lifespan, instead of taking wood from forests. If you really want hardwood (and who doesn’t), make sure you source it from a plantation rather than a company that logs our old growth forests. Australia is a huge country, so by buying locally, you prevent materials and goods from being shipped across this vast continent. The less distance the material has to travel, the less impact you’ll have on the environment. Australia is the driest inhabited continent on earth. Water is always scarce, so don’t create a garden that needs to be watered all the time. You should also make sure you collect rainwater wherever possible. You can do this with a rainwater tank, or by placing open vessels in the garden so you’ve got a full watering can after a good rain. If you want a garden that can survive off a few drops of water, fill it with native plants. Unlike overseas species, they are designed for our dry climate. By using gravel instead of hardscaping, you prevent water run-off. When rain falls, it will be filtered through the gravel and go back into the soil which is good for your garden and good for groundwater levels. You’ll also prevent any toxic chemicals from running out of your backyard and into stormwater drains where it contaminates sea water. There are plenty of natural ways you can fertilise your garden and control pests without turning to toxic chemicals. Starting a compost bin is the best way to feed your garden. Or, you can buy organic and natural options from your local nursery. When it comes to garden sprays, go for natural options containing garlic, elder and rhubarb leaf and build a water-feature or pond to attract insects and reptiles that will keep all the nasty creepy-crawlies at bay. One of the most significant problems facing our local environment is that essential wildlife populations are being displaced or entirely lost. You need to fill your garden with plenty of flowers and plants that will attract bees and local birds. Both species are vital in sustaining the eco-system and ensuring that crops are pollinated. Banksias, wattles and Kangaroo Paw and great for bees. Basically, anything with an open face and bright colours will attract these essential little creatures. Rosemary and lavender are especially good sources of nature which is vital in sustaining the bee population. Bigger trees are perfect for birds, and those birds will also help in controlling bugs in your garden. To give even more help, put some food scraps and seeds and build boxes for them to live in. Remember, your home has displaced their home, so it’s the least you can do. Recycling your green waste is vital. Recycling stops waste rotting away in landfill and adding noxious fumes to the air. By composting, you’re making sure the natural cycle is restored. Just get a compost box and add everything from trimmings to lawn clippings, and even egg boxes, vegetable scraps and tea bags. That compost heap will save a lot of money on fertiliser. So, there’s your guard to going eco in your backyard. You’ll create a beautiful, natural garden that is bursting with life. Plus, you’ll know you’ve done your bit to turn back some of the damage we inflict on the environment in day-to-day life. The team at Everlast Services is committed to going green. If you want any advice on turning your garden into a sustainable slice of paradise, get in touch with us, and we’ll be more than happy to lend our expertise.